Lifeguards Union Leader: Why Weren’t We Sent to Help Harvey Victims? The head of the lifeguards union in San Diego accused the fire chief of blocking a deployment to the Hurricane Harvey disaster in Texas, but the chief said assistance from the lifeguards has not been requested. In an open letter to Texas Gov. Gregg Abbott and the mayor and citizens of Houston, lifeguard Sgt. Ed Harris, a former interim City Council member who finished third in the mayoral race last year, wrote that his team packed its bags last week and readied its boats as it watched Hurricane Harvey approaching the Gulf Coast. At a news conference, Fennessy told reporters that 24 members of the San Diego Fire-Rescue Department were performing rescues Tuesday in Katy, Texas, as part of the Urban Search and Rescue California Task Force 8, a specialized team of rescuers from more than 21 agencies around the county. That task force specializes in large-scale urban disasters, and more specifically confined space search-and-rescue operations when structures have collapsed, according to the city of San Diego. He said a swift-water rescue team made up primarily of lifeguards has not been requested. Deployment decisions are made by the Federal Emergency Management Agency and state offices of emergency services. Harris might not understand how the system works, the chief said. Fennessy said he’d like to be in Houston himself. “All of us in public safety want to be there — we can’t all be there,” Fennessy said. He said Harris and another lifeguard employee sent an email asking for time off so they could go to Texas to help. The agencies that coordinate disaster responses discourage “self-deployments,” according to the chief. Harris said the lifeguard river rescue team is “nationally recognized” and it also “spent weeks rescuing people during Hurricane Katrina.” He said even after the team was told Saturday to give its boats to SDFRD, the team members remained ready and willing to head to Texas. Lifeguard Chief Rick Wurts said he was proud of the preparation his employees made, but ultimately it was the search and rescue team that was called upon. Harvey, which is now a tropical storm, made landfall in Texas on Friday night as a Category 4 hurricane before moving back over the Gulf of Mexico. 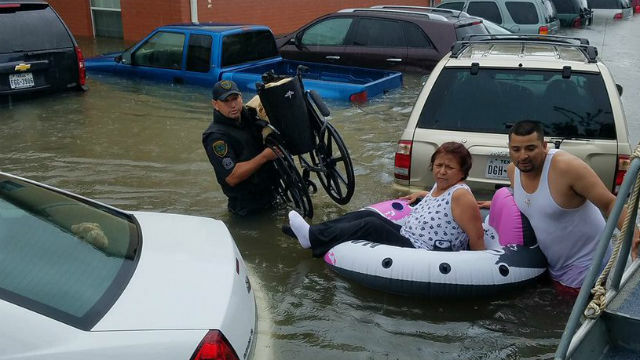 It has already dropped close to 50 inches of rain in some areas near Houston and caused catastrophic flooding in Houston and the surrounding areas. The Houston police chief said Monday morning that authorities had already made at least 2,000 rescues in the city. Harris is no stranger to disputes with the fire department. In the lawsuit, he claimed funneling 911 calls for inland water-related emergencies to the city’s fire department dispatch instead of lifeguard dispatch had caused confusion and delayed response, with one such incident involving a 2-year-old at Mission Bay Park. But city officials countered that reassigning such calls to the SDFRD dispatch center was a necessary move because the lifeguards’ system, which only allows for two calls to be answered at a time, tended to be quickly overwhelmed, forcing some 911 calls to go unanswered during high-volume periods, such as in severe storm conditions. “Lifeguards and firefighters are dispatched to inland water rescues simultaneously and within seconds of 911 calls — far faster than lifeguard dispatch is able to accomplish,” Fennessy told reporters in March. According to Fennessy, emergency response times had improved as of March, not worsened, since the dispatch change went into effect in January. The procedural revision has resulted in no calls going unanswered during extreme storm conditions this year, the chief asserted. “I’m profoundly, profoundly disappointed in lifeguard Sgt. Harris,” Fennessy said. “In my opinion, to politicize his own agenda when the great state of Texas, the city of Houston, the suburbs and now Louisiana — thousands of people are suffering, people dying — to represent that we or the system failed in sending him or his lifeguards out is a flat lie,” he said. He said the SDFRD will look into whether Harris crossed any kind of line with his letter that might warrant disciplinary action, but his role as union head allows him to take “some liberties” that other employees can’t.